Originally published in The Courier-Mail. In his new show, Arj Barker is asking audiences to get inside his head. Get In My Head, which opens at Brisbane Powerhouse this week, traverses a landscape of all manner of weird and wonderful topics the witty comedian has thought about over the years, from the social evolution of humanity to non-sexually derived boners to fondue. He admits the insides of people’s heads are probably much more bizarre than we’d like others to know, despite what we reveal on Facebook. “I think the amount that we reveal to the outside world is a lot less than what’s actually happening,” he says. “There’s a level of politeness that keeps us from saying a lot of our thoughts out loud. “And then sometimes you don’t agree with your own thoughts. You think something and then you think well, actually I don’t think that but I just thought it. 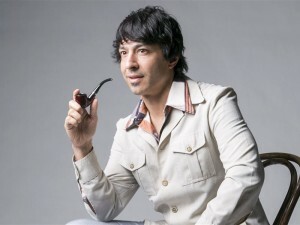 Barker, who writes all his bizarre ideas down in mountains and mountains of notebooks, has been making Australian audiences laugh for more than 15 years. He first came to the country in the late ’90s, performing on TV’s Hey, Hey, It’s Saturday, hosted by Daryl Somers. Some of his friends back home are surprised by how popular he is in Australia, though he doesn’t like to talk it up. He thinks that maybe his exoticism was part of his early appeal, although the cultural differences between California and Australia aren’t too broad. While he still calls California home, right now he is based in Melbourne, though he has also spent a lot of time in Australia’s laid-back capital, Byron Bay. It’s an area that reminds him of where he grew up in the offbeat and geographically picturesque county of Marin, north of San Francisco. For 18 days this month, however, he’ll be based in Brisbane. In the evening he might stop off at his favourite restaurant Taj Mahal in New Farm. During the day he hopes to be productive, working on a new show as well as a television idea. Now in his early 40s, Barker is not slowing down, although he admits he’s less of the party animal he was in his youth. A good night these days might include settling down with some good food and a movie with his girlfriend and pet bulldog. “I still have a lot of fun. I just don’t feel as bad in the morning,” he says. Turning 40 was no big deal. “It was not really a major event. I just went out to dinner with a few friends. Nothing felt like it changed really. I thought maybe it would be a big deal but it’s really not. It’s like New Year’s Eve, just another day on the calendar. He’s glad that he followed the comedy muse in his youth, taking and making opportunities where he could. “I can’t say I don’t have any regrets but one thing I’m glad of is that I went for it,” he says. And you can see Barker in action from next week, with his buddy Joel Ozborn in support. Barker will be signing DVDs and selling “sticker packs” afterwards, so come on down, he says.